manage the learning progress. The user is able to get maximum efficiency with minimum time by this learning system. - Design one robot a week and it is possible to nurture the creativity and active attitude by doing various robot projects. 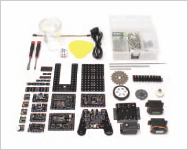 and operate in the assembling process of various models. and internal structure of the object. Also, students can improve their spatial perception ability from the assembling process. 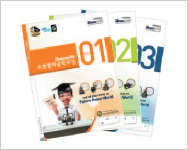 Workbook which increases the learning efficiency! It is organized for the user to check and revise the important points and allows the user to go to the next level after insuring the most important points. it delivers the learning content efficiently through a quiz that is related to learning. Users can complete their own workbook. It allows the user to feel the accomplishment by testing themselves about what they learned today and improve their self-learning skills. 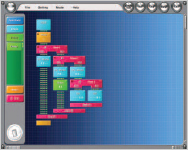 GUI (Graphical User Interface) allows the user to enjoy the programming much easier. Not controlling the robot with a simple icon but nurture the theoretical and mathematical basic ability through the Flow-chart concept algorithm programming. loop etc. ), functional call and so on. are possible, so the user is able to control more preciously and professionally. thus the user is able to control more preciously and professionally.